Usually when I'm buying potatoes, I don't think beyond the two most basic categories of 'waxy' for putting in salads or 'floury' for mashing or roasting. I'm not unique- a careful inspection of the choices available in your average supermarket will show that stores, and therefore consumers, see potatoes as potatoes. Or should I say consumers and therefore stores? Who knows? The point is, we don't seem to be very in touch with the amazing vareties of potatoes that nature has to offer. I've decided to start paying more attention to the proper names of my vegetables. As InnBrooklyn points out, if we as consumers can name and ask for specific varieties, we can create the demand for them. I for one, would love to find the same kind of interest in varietal species in my local everyday supermarket as I would in the specialist farmer's markets and farm shops. 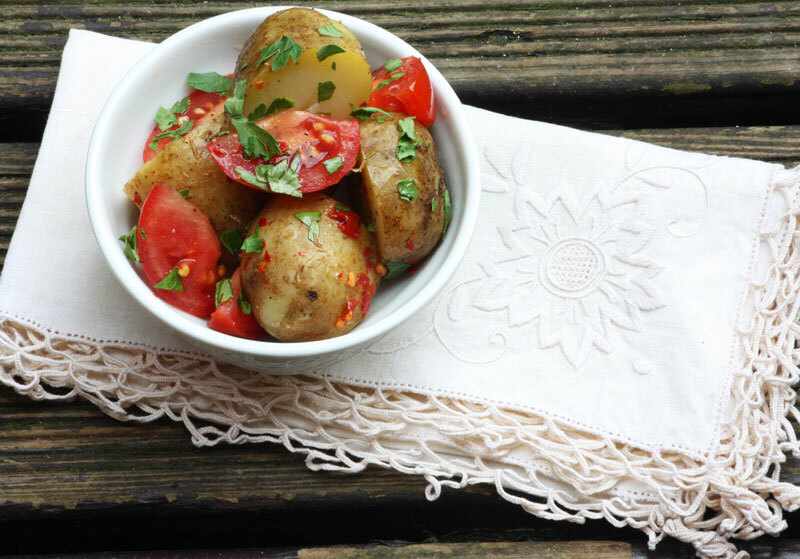 For most of the year in the UK, people only see shades of waxy and floury, but when spring hits, everyone really starts to go nuts about Jersey Royals. The mere mention of the name elicits lots of 'ooh's and 'mmm's from just about every English person I know, with good reason- they really are delicious. They're full of flavor, and would be perfectly dressed with just a little butter, salt and pepper. 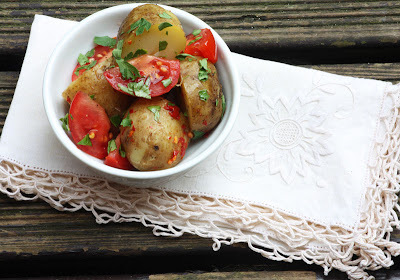 It seems kind of obvious to describe a potato as 'earthy' tasting, but I think these are more so than your average spud. 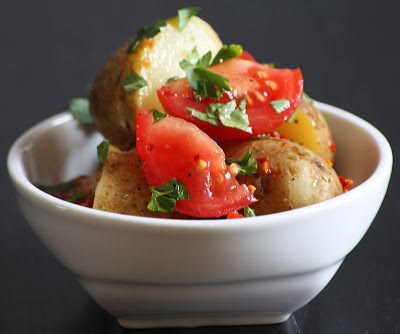 Somehow I doubt anyone wants to read a post in which I describe how to put butter on potatoes, so I decided to jazz mine up in a salad with a little north-African harissa. Addictive stuff. Scrub the flakey exterior of the potatoes but do not peel them. Cover with water and boil for about 15 minutes or until just cooked in the middle. Drain and set aside to cool a little while you prepare the rest of the salad. Combine lemon juice, olive oil, and harissa in a bowl, then add tomatoes, warm potatoes, parsley, and plenty of salt and pepper. Toss to coat all of the vegetables in the dressing and serve. 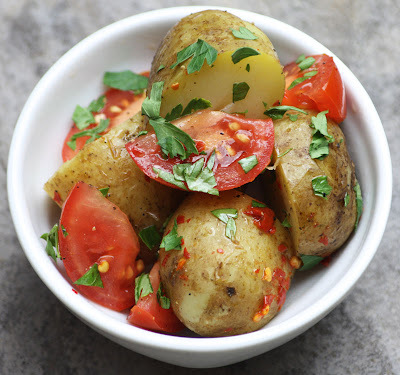 You're absolutely right about the different varieties of potato, while living abroad I was confronted with the rather disappointing choice between washed or unwashed... there's a whole untapped world of spud out there! You make a great point about the Jersey Royal and I plan to whip the salad up as soon as the sun eventually reappears. If you're interested in other great British varieties, I suggest the King Edward for the best thick cut chips (fries) and the Maris Piper for superior mash - perfect with a chunky steak pie. Great to see a site about REAL food! This looks great: simple and perfect, I'm going to have to try it. Thanks for the link to our potato post: if we work together maybe we can revolutionize the potato market on both sides of the ocean!! Kev- Maris Pipers and a steak pie sound fantastic. Serously comforting! Talia- Thanks! Yes, let's start a trans-continental varietal potato movement!